After I completed the novel in March, I had to wait. Today the official READING EXTRACT has been published and I am delighted to take you away to the city of Varanas - this time into its 'Shadows', the part were the unwanted and unhappy are forced to live. 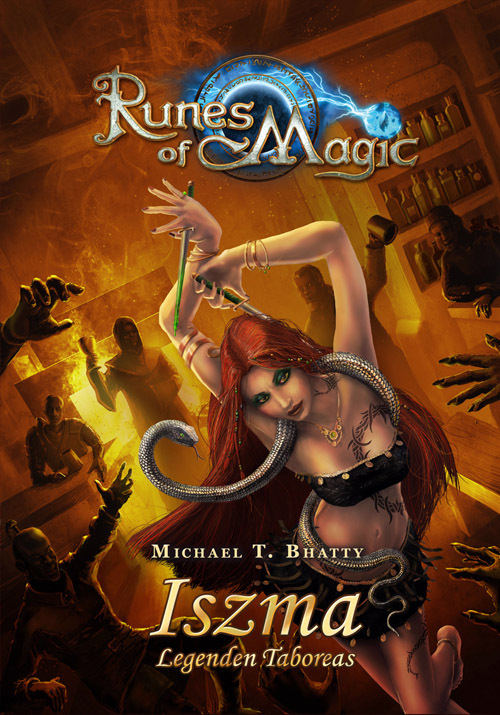 Download the PDF with the reading extract of ISZMA here! Now that the cover has been officially displayed on Amazon I like to tell how it was developed and how this influenced my writing. The Cover Art of the novel was created by Frogster's graphic artist Thomas Kempkes; check out his art at DeviantArt. However, what Thomas got from me was an Artwork similar to this one (i am keeping my version for now as it contain's a spoiler;-) And so he, Bex and I started working on the process of finding our way to our Iszma. Note how her hair colour got from a darker brownred to the more fiery red. It is always a long way for a printed novel to be published in book form. While my work is done editors and correctors do their work and polish the tale to give my readers a (hopefully) wonderful experience. Thank you my friends for making this a wonderful tale. With me my own tension is rising as this novel will be the conclusion of the three novel SHAREENA, ASIYA and now ISZMA. I consider this one even more powerful that it's predecessors as I can build on the tales of the first two novels, on the characters and events. ISZMA will throw you into a dark and lustful world, a world filled with the darkest emotions, but also with hope and love.